We love to write about the good things happening at the shelter, but there are also many sad events that keep the shelter full even during weeks when we have many adopters taking home new pets. 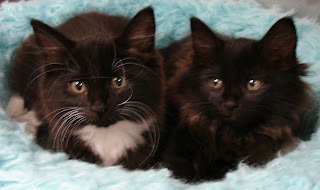 Yesterday we volunteered to take in these two kittens who had been rescued by Needham Animal Control. The kittens were found in a box in the middle of a road. There were two boxes. People who lived near where the boxes were found thought someone had thrown their trash in the road. The boxes first appeared around dusk this past week on a cold, rainy night. They were still there at 8:00 am the following morning. Thankfully someone went to move what they thought were empty boxes out of the middle of the road. These two innocent and adorable kittens were found soaking wet and shaking with fear inside one of the boxes. The other box had been torn apart and was empty. We fear that perhaps the kittens' mother had been in that box. How could anyone do something so cruel? Needham Animal Control and kind-hearted people who live in the area where the kittens were found are keeping watch to see if mom or whoever was in the other box comes around. We hate to think that we live among people who could do something so mean. We are however encouraged by the efforts of the rescuers and Needham Animal Control in saving these precious little girls. They are now in a foster home where they are getting some intensive tender loving care. We hope these precious little ones will completely forget about the cruelty they experienced and only remember all the love they are now receiving in their foster home. We are eager to find these friendly little babies a special and very loving forever home.